Revenue in the Women's & Girls' Apparel segment amounts to US$33,712m in 2019. The market is expected to grow annually by 1.8% (CAGR 2019-2023). In global comparison, most revenue is generated in China (US$128,669m in 2019). In relation to total population figures, per person revenues of US$503.47 are generated in 2019. The Women’s Apparel market covers apparel for women and girls. Children’s clothes are not separately defined, with the exception of clothes for babies. The former are instead subsumed under the other clothing segments. This range of products constitutes the largest share in revenue within the entire clothing market. The market for Women’s Apparel is subdivided into the following segments: coats and outdoor jackets, blazers, suits dresses and skirts, trousers and sweatshirts and blouses. Reading Support Revenue in the Women's & Girls' Apparel segment amounts to US$33,712m in 2019. Reading Support The Women's & Girls' Apparel segment is expected to show a revenue growth of 2.6% in 2020. Reading Support The average revenue per person in the market for Women's & Girls' Apparel amounts to US$503.47 in 2019. Reading Support In the market for Women's & Girls' Apparel, volume is expected to amount to 1,060.90 m pcs. by 2023. 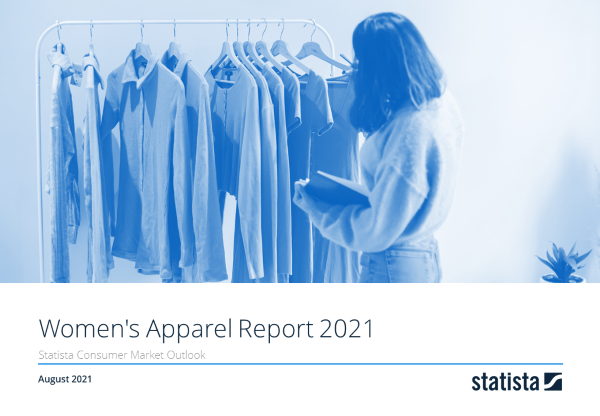 Reading Support The market for Women's & Girls' Apparel is expected to show a volume growth of 1.1% in 2020. Reading Support The average volume per person in the market for Women's & Girls' Apparel amounts to 15.22 pieces in 2019. Reading Support The average price per unit in the market for Women's & Girls' Apparel amounts to US$33.08 in 2019. Reading Support With a market volume of US$128,669m in 2019, most revenue is generated in China. Here you can find more studies and statistics about "Women's & Girls' Apparel".